The third-busiest airport in the whole of Canada, Montreal's Pierre Elliott Trudeau International Airport (YUL) enjoys high yearly passenger figures, which are rapidly approaching 14 million. Run by the Aéroports de Montréal and sited alongside the Dorval Golf Course, the Pierre Elliott Trudeau Airport has long been an important base for Air Canada operations. Other notable Canadian airlines operating at the airport including Air Creebec, Air Transat, Porter, Skyservice, Sunwing and WestJet. Montreal Trudeau Airport is known for its high level of international flights, which make up around 60 percent of the overall traffic. Situated just 25 km / 16 miles west of downtown Montreal, the suburbs of Côte-Saint-Luc, Pierrefonds, Ville-Saint-Laurent and Westwood are all nearby. Taxis and limousine services are readily available at the airport. There is also a daily direct shuttle service from Montreal Airport to the downtown Aerobus Station in Montreal and also to Mirabel International Airport. There is a shuttle service from the airport to and from many of the major hotels. 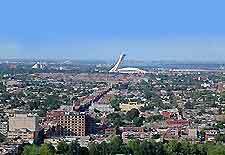 The city of Montreal lies within Canada's Quebec province and is the second-biggest city in the whole of the country. Located on the far south-eastern side of Canada and relatively close to the world-famous Niagara Falls, Montreal is filled with dramatic skyscrapers and stylish modern buildings, which combine to make an impressive skyline. Tourists flying into Pierre Elliott Trudeau Airport (YUL) often head straight to Montreal's waterfront, where they enjoy a cruise along St. Lawrence River, while others prefer to visit the main sights, such as the Biodome, the Insectarium, the Dow Planetarium, the Biosphere, the Underground City and La Ronde amusement park. For a little more history, both Montreal City Hall and the Notre-Dame Basilica are of local importance, while for others, a visit to the Olympic Stadium is in order, which was built to host Montreal's successful 1976 Olympics.